UNITED NATIONS, Sept 20 (APP): Prime Minister Muhammad Nawaz Sharif Tuesday said the Kashmiri people must be allowed to choose their destiny in accordance with the long held commitment of the international community through United Nations Security Council (UNSC) resolutions. counterpart Shinzo Abe on the sidelines of the 71st United Nations General Assembly session here, also raised the plight of the innocent Kashmiri people at the hands of barbaric Indian occupation forces. valuable influence and urge India for ending human rights violations in the Indian Occupied Kashmir,” Prime Minister Sharif said. 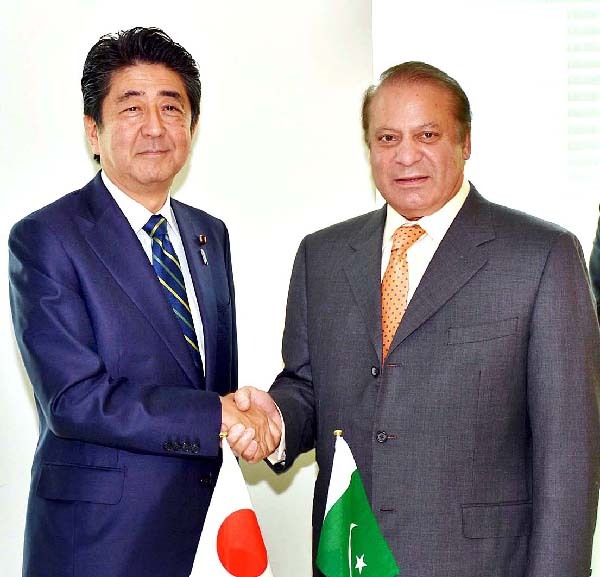 The Japanese Prime Minister also expressed his deep concern over the present situation in the Indian Occupied Kashmir. fields and Japan could bring the capacity to produce value added goods and also benefit while investing in diverse fields in Pakistan. annual bilateral trade of US$ 1.86 billion and this trade needed to be enhanced further, the Prime Minister added. implementation of the National Action Plan to eliminate terrorism and violent extremism had restored peace in the country, adding the economy was boosting and the country was achieving self sufficiency in energy. the foreign investors and made Pakistan an ideal destination for investment. counterterrorism efforts, economic reforms and Prime Minister Sharif’s endeavours for reaching out to neighboring countries for the sake of regional peace, stability and prosperity of the people. Quetta and other cities and extended his condolences on the loss of precious lives during the terrorist attacks. The two sides expressed concern over the recent developments in the Korean Peninsula. Pakistan strongly condemned the recent nuclear tests conducted by North Korea and urged it to abide by its international treaty obligations, Prime Minister Sharif said. reiterated its desire for a stable and prosperous Afghanistan. between the two countries needed to be deepened. The meeting was held in a cordial and friendly atmosphere and both the sides agreed to enhance frequency of high level interaction in order to lend momentum to bilateral ties. General Assembly session in September 2013.